Sennelier Coloured Ink combines high-quality colour with excellent light resistance. These rich inks are made with shellac that gives an artist a vibrant colour to work with. These coloured inks are easy to apply and can be used with either a brush or a drawing pen. This medium is ideal for drawing, calligraphy and washes. 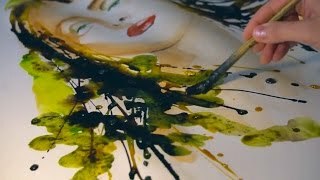 Sennelier ink dries quickly and has a good water resistance without being indelible. When dry, Sennelier ink has a pleasing satin sheen. Their already excellent light fastness can be improved even further by the use of a protective fixative.